Meet Dina and Anissa. Both girls work in my office, they are cute, they are noisy chatterboxes, and they are twins. From different parents. Ok, I lied. But in these brick red batik prints, they look like sisters, aren't they? Actually when Anissa wears this, she gets a lot of this question: "Why are you wearing a night gown to the office?" That's because batik is a popular fabric for sleeping wears, especially for older women. Ha-ha! 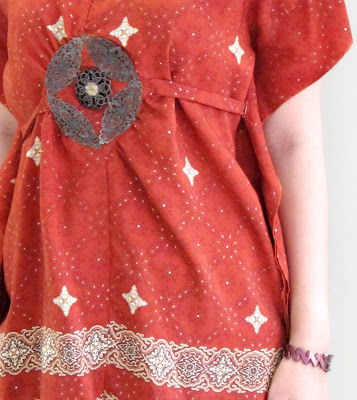 Notice how she smartly cinches the waist with this wide belt, so the batik dress has a lovely shape. Also, the dress has a high slit at the front, which she sewed up for modesty. An office is definitely not the place to show up those tighs, no matter how confident you are of your legs! Anissa pairs her ensemble with a pair of brand new gold and black heels, only IDR 120,000 (about USD 12) from Centro Hot Sale at MOI Kelapa Gading. For Jakarta sale info, click here. Now let's take a look at what Dina wears. It's a pretty batik top with a lot of embelishments. You can basically fit the top to your size and level of comfort. Cinch it you like it to be a bit more fitted, or just let it loose. Clever, huh. I wonder why they don't create more dresses and tops with this nice trick at the back. Friday is two days away and it's Batik Day! If you are an Indonesian, what kind of batik are you going to wear? And if you are from other countries, why not blending some culture into your daily wardrobe? It's stylish, it's patriotic, it's fun fun fun!